Last year, we told you about Namaste India!, Room to Read’s global yoga benefit to raise funds for girls’ education in India. Over 100 studios, teachers and yogis on six continents generated enough funds to send 160 girls to school. This year the campaign is more ambitious; now called Namaste World!, its reach will extend beyond India to girls in all of the countries where Room to Read works, with the goal of providing 200 bright minds with a chance to learn and flourish. In Paris, Namaste World! 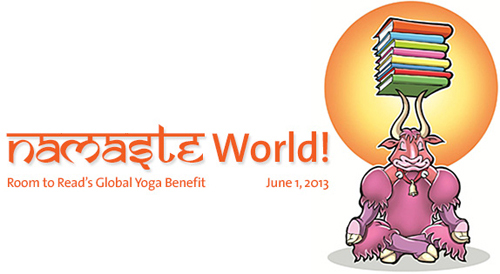 will take place from June 1st through June 8th, providing yogis with many opportunities to support this remarkable cause. Take a look at the list below, and sign up to participate! If you know of a studio that would be the perfect venue for a class, or if you’re a studio owner or teacher who would like to lend your space and talent, please get in touch with Room to Read’s Paris Chapter at paris@roomtoread.org. • Yoga Yoga Paris (7e): Sunday 2 June 18h-19h30. Sign up here!